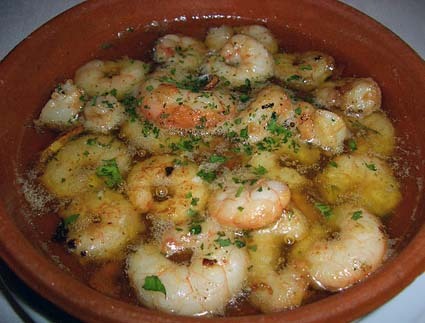 Gambas al Ajillo are served sizzling hot in their individual cooking dish. Serve with a piece of baguette for dunking the aromatic garlic oil. sizzle in the olive oil while eaten. Slice the chili pepper and remove the seeds. Heat the olive oil in an ovenware dish on the stove or in the oven over high heat. When the olive oil is sizzling, add garlic and chili pepper. 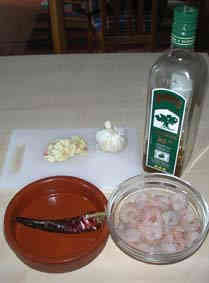 When the garlic has taken little color add the shrimp. Stir and sauté for about 3 minutes, until the shrimp are done. 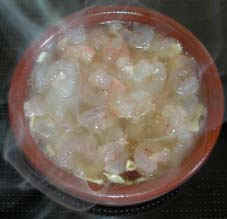 Remove shrimp from the heat, sprinkle chopped parsley on the top and cover with a lid or a plate. Serve directly from the cooking dish while still sizzling. Serve with baguette, for dunking the aromatic oil.